RobotUnion will join the Mobile World Capital Barcelona team at DLD Tel Aviv Innovation Festival during the 4-6 September 2018. A selection of startups from the European Projects IMPACT Connected Car and IMPACT Growth will get introduced into the digital ecosystem and given the opportunity to connect with investors and corporations. 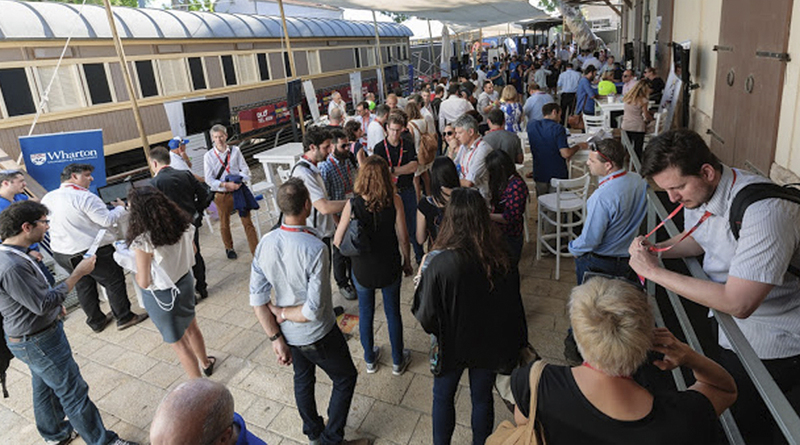 What is going to happen at DLD Tel Aviv? September 5-6th 2018: Find about funding opportunities and meet accelerated startups! You will find us at booth 31 in the Startup Blvd. Absolute Zero: Delivers outstanding technologies for a new breed of 360° content producers. Their mission is to help customers focus on creativity and the production of 360ºcontent. Transforms complex technology into simple solutions and create easy-to-use devices for 360° photography/filming and imaging. Argus: Provides comprehensive and proven solution suites to protect connected cars and commercial vehicles against cyber-attacks. 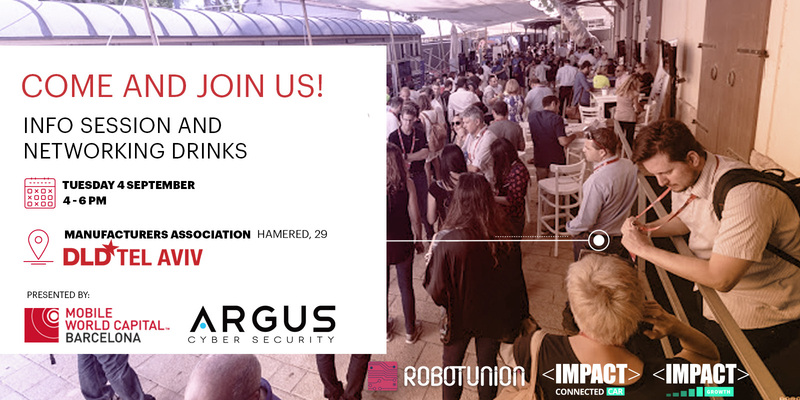 With decades of experience in both cybersecurity and the automotive industry, Argus offers innovative security methods and proven computer networking know-how with a deep understanding of automotive best practices. Customers include car manufacturers, their Tier 1 suppliers, fleet operators and aftermarket connectivity providers. Artudata: Software that increases revenues by leveraging artificial intelligence to target highly converting customers, boosts efficiency and ROI while reducing the cost per acquisition. Their speciality is products and services with high price tags, like financial services: loans, investments, trading and insurance, real estate, luxury products, Mobility and more. Their technology provides simple to use tools to increase profitability by reducing CPA and increasing conversion rates and clients value. CARFIT: AI-based technology that reads car vibration to make maintenance easier and mobility safer. HEVO: Global wireless charging standard for electric vehicles (EV), an end-to-end solution that provides a safe, affordable, reliable, and seamless method of EV charging. Ultimately, HEVO’s wireless charging hardware connects users to their vehicles via mobile software, such that charging an EV is as easy as tapping a screen. Motor Ai: Offers mobility digital services for end consumers, the car manufacturing industry and public transportation systems. The Motor Ai device unlocks the opportunity to collect mobility data and develop services to support both B2C and B2B applications. Parkbob: App that warns you when you park in a restricted area and shows available parking spots nearby. Parkbob digitizes the last-mile: digital street parking rules & restrictions, covering 45 cities in EU/North America, 70 EOY18; and data science-based parking information that helps drivers to take better decisions. 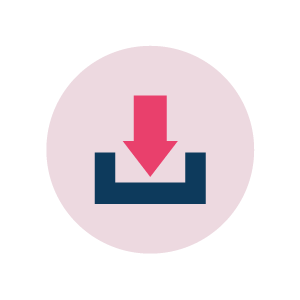 This is offered as an API service to companies who wish to enhance their existing last-mile experience, e.g. OEMs, Tier 1s, navigation service providers, mobility providers as well as parking payment providers. Skyx: Agricultural-robotics technology company enabling a modular swarm of autonomous drones for spraying. The innovative solution enables variable rate application at hotspots, or uniform coverage of an entire farmland. They serve agri-spraying applicators that require new standards for their cost, accuracy, availability and safety.